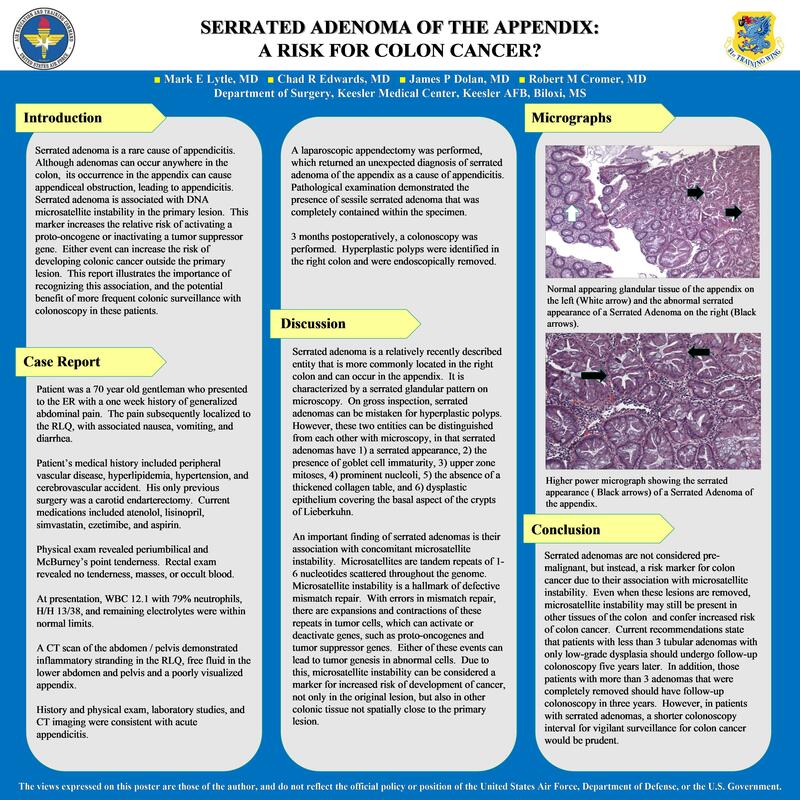 Serrated Adenoma of the Appendix: A Risk for Colon Cancer? Because of the association of serrated adenomas with microsatellite instability in concomitant colon polyps, a more vigilant surveillance may be needed to screen for colon cancer. This is an interesting case of a serrated adenoma of the appendix as a cause of acute appendicitis. This patient is a 70 year old male who presented with intermittent right lower quadrant pain for one week. Initial laboratory data revealed leukocytosis with a left shift, normocytic anemia, and thrombocytosis. A CT of the abdomen showed inflammatory stranding in the RLQ, free fluid in the pelvis, and an appendix measuring 6mm. After admission for diverticulitis, an ultrasound of the appendix revealed a noncompressible appendix with fat stranding in the pelvis. An Lap appendectomy was performed. Lap visualization revealed an inflamed appendix with a gangrenous tip. Pathological exam demonstrated the presence of acute appendicitis with rupture and a sessile serrated adenoma that was completely contained within the specimen. Because of the association with microsatellite instability in concomitant colon polyps with possible progression to colon cancer, a post operative colonoscopy was performed. This revealed hyperplastic polyps in the right colon. Due to the fact microsatellite instability may exist in any or all of the polyps with increased risk of progression to colon cancer, arguments can be made to decrease the length of time between screening colonoscopies.